A Vending Permit represents approval of your mobile business's use of City property. City property includes roadways, sidewalks, parks and other property owned by the City. Vending Permit: Required for vendors operating vending units on property owned by the City of Edmonton. Umbrella Vending Permit: Required for festivals and large events that would like to allow one or more vendors to operate at the event. Special Event Vending Permit: Required for small events, including Community League events, that would like to allow one or more vendors to operate at the event. Note: Fees vary for these permits depending on whether the vendor has proof of not-for-profit status or creates art. See the fees section for more information. Vendors are categorized into Food and Beverage, Ice Cream Only or Other vendor categories. All vendors require $2,000,000 (two million dollars) of general liability insurance coverage and a business licence from the City of Edmonton. Food and Beverage and Ice Cream Only vendors also require a Food Handling Permit for the vending unit, which can be obtained by completing the Food Handling Permit Application and submitting it to Alberta Health Services. The City maintains an Approved Vendor List that includes vendors who comply with City Bylaws, Vending Guidelines, and the Terms and Conditions. The vendors on the list have a current City of Edmonton business licence, valid public liability insurance and, if the vendor is a Food and Beverage or Ice Cream Only vendor, a Food Handling Permit. These vendors can be hired for private events on City property or by the City for civic events. The list does not represent a City endorsement; any vendor that complies with the requirements will be added to the list. Please contact the Street Vending Coordinator if you have questions or comments regarding the information that has been provided about your business. The Vending Permit Application Form requires you to provide information about your business. Complete the form on your computer and save it for an email submission or print it off and fill it in manually. Businesses also have the option of an online Vending Permit Application. There is also an online application for the Special Event and Umbrella (Festival) Vendor Permit Application. Before completing the application, it is suggested vendors use the Road Projects web pages to help them in choosing locations that will be free from construction conflicts. Vendors should also consult the Street Vending Location Guidelines for the specifications on setting up operations on street and sidewalk rights-of-way. Attach insurance documentation displaying the expiration date and amount of coverage. Use the checklist on the application to verify you have all required documentation and attach if necessary. Effective July 20, 2015, food truck operators and food trailer operators are required to provide third-party certification of inspections, in addition to the existing requirements, in order to acquire any future vending permits. Submission of Certification of Inspection forms completed by a third party inspector registered in the Province of Alberta demonstrates proof of compliance with the existing legislated safety standards. To minimize delays in processing, please ensure the application is complete and that all necessary documents are submitted. Original copies of the Vending Permit, business licence and Food Handling Permit (if required) must be kept on site during operation. Posting the Vending Permit in an easily visible place is required. In circumstances where visibly posting the permit would be unreasonable, the permit must be kept on site and provided upon request. Vendors are required to keep vending areas clean and neat. This includes ensuring garbage is removed and the vendor’s presence does not negatively affect the vending area. To assist in efforts to keep areas clean and neat, all vendors are required to provide garbage and recycling receptacles for customers. All vendors must adhere to the City's Vending Terms and Conditions. Businesses which have a vending permit can use the online Vending Permit Renewal application. If you want to cancel your vending permit, use the online Vending Permit Cancellation Request. Once the application and documentation is submitted to the City it will be dealt with by the appropriate department depending on the location request and type of permit. Once permits are issued, the Street Vending Coordinator may inspect locations to ensure the vendor or event is in compliance with applicable bylaws and the Vending Terms and Conditions. Contact streetvending@edmonton.ca for questions about fees. 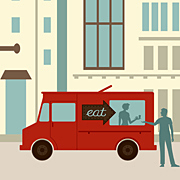 In May 2018, the Alberta government released information specific to the construction and operation of mobile cooking operations, including food trucks. These requirements apply to any mobile cooking operation considered for use in Alberta. Please refer to the Standata report issued for a joint code interpretation. For more information go to www.nfpa.org/foodtrucksafety. I would like to find a location to operate my vending unit. Will the Street Vending Coordinator help me find a location? No. The Street Vending Coordinator is available to process your application and provide information about the service. You are responsible for finding a location and submitting it via the application. Do I have to pay for multiple permits if I want to vend at multiple locations? It depends on how many units you would like to operate. If you have a single unit and you would like to operate it at multiple locations, you will only be required to pay for one permit. If you have multiple units and would like to operate each one at different locations, you will be required to obtain and pay for permits for each location. I would like to vend on Transit property. Who do I contact? If you wish to vend on Transit property, which includes LRT stations, transit centres and transit facilities on titled City land, see Selling, Distributing and Other Activites. I am organizing a small event taking place on City property. What do I need to provide to the Street Vending Coordinator? You will need to provide all event information, including the location, date, time, and event organizer’s contact information, as well as a list of all vendors and their contact information. How do I get my business added to the Approved Vendor List? Contact the Street Vending Coordinator with a request to be added to the list. You will need to provide a copy of your valid business licence and insurance documentation that displays an expiration date. I sell paintings, photos and other artwork. Do I pay artist fees or standard vendor fees? It depends. To be considered an artist and pay artist fees, you must create the art you sell or distribute. This means the vendor must be the one who paints, takes the photographs, or otherwise creates the artwork to be considered an artist. I am a busker. Do I need a Vending Permit? No, buskers do not need a Vending Permit. To be categorized as a busker you must entertain for donations without negotiating a price for the entertainment. If you wish to busk on Transit property, which includes LRT stations, transit centres and transit facilities on titled City land, permission from ETS is required. Call 780-496-1622 or go to the Customer Service Office. I want to be classified as a not–for-profit vendor. How do I receive this classification? To be classified as a not-for-profit vendor, you must provide proof of not-for-profit status to the Street Vending Coordinator. Major projects that are currently under construction.